If you want iron railings in Cardiff for your home, commercial property or public space, then make a once in a life time investment. Choose high quality, durable cast iron railings from Period Gates. These are guaranteed to make a massive impact anywhere in Cardiff due to their ornamental and traditional design which denotes quality and craftsmanship. And, they will never need to be replaced. All our iron railings, posts and gates available in Cardiff were created using the exact same foundry techniques passed down for generations. Call us today on 01384 900 260 to find out more about our iron railings or get a quote. 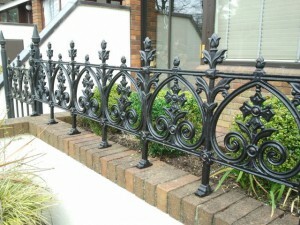 You don’t have to make do with cast iron railings that are not the right size for your Cardiff space. 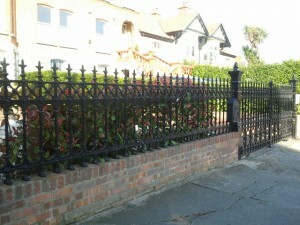 We offer iron railings in half and full size, and they can be further customised to meet your exact requirements. In addition to this, our railings can be configured to helm curved spaces. Our cast iron collections offer you a wide range of designs to choose from, all based on breathtaking 19th-century designs. Take a look at the inspiring designs from out Argyle, Eglington, Gilberton, Stewart and Stirling collections to see how our cast iron railings can revamp your Cardiff property or premises. Please also look at the pictures in our gallery for inspiration about your next railings. You can trust the quality of your Cardiff iron railings as they will be made using the same traditional foundry techniques that made those beautiful Victorian and Edwardian pieces we know and love. Their beauty is matched by their sturdiness and longevity. Once fitted in, these cast iron railings will serve you for many years and will add to the value of your Cardiff property should you decide to sell it. To find out more about our iron railing designs and gates to match, call us on 01384 900 260 or fill in this request and submit it online.